Why cook for four if you can cook for eight? This seems to sum up the philosophy of home cooking in southern Italy in a nutshell. It’s all very stereotypical, I know, this image of the mamma slaving over a hot stove to produce gargantuan quantities of food for a ravenous family and any last-minute unexpected guests. A stereotype, maybe, but every time that unexpected guest was me, I’ve found it to be true. So, in honour of all those resourceful Sicilian mammas, today I’m giving you the classic stretchable meal, spezzatino. This is simple home or trattoria cooking, not the sort of thing you’ll find in serious restaurants, my dear. Which, of course, is part of its charm. That said, the first time I encountered it I felt anything but charmed; I felt more like I was being swindled. Having been weaned on English stew, when I was given my first dish of spezzatino, I suspected I was the victim of a joke, a classic “let’s play with the tourist and see how he reacts”. Where were the carrots, the barley, the lentils? Where were the dumplings? Because this “stew” was clearly just boiled beef and potatoes. I wasn’t even sure if it deserved to be called “stew” at all. And then I tried it, my fork ploughing through the meat as if it were soft butter, the potatoes impregnated with a rich, savoury broth. And I realised that yes, it was just boiled beef and potatoes, but that I didn’t really care what it was called, because if your beef is good, and your broth well-seasoned, that’s all you actually want. 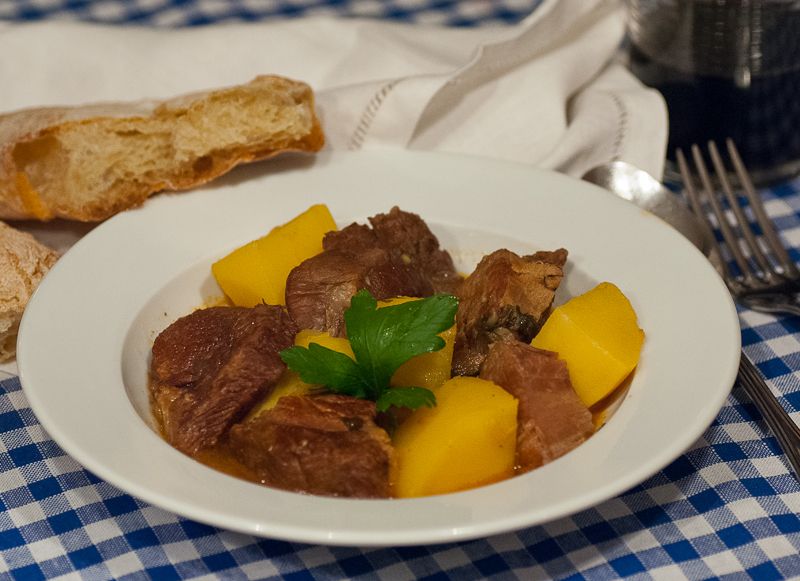 I had grown up on a diet of excellent beef, yet it took a bowl of Sicilian stew, from a region hardly renowned for this meat, to get me to really taste it. I haven’t tried cooking this back in England, with top quality local produce, so you’ll have to do it for me and let me know. But I’m prepared to bet you’ll never want stew any other way again. The clean, pure hit of beef you get from this will surprise and seduce you. And one of the secrets (because it’s all in the details) is the white wine. Use red (as they do elsewhere in Sicily and Italy) and it will still be good, but not as good. The white wine lifts the flavour of the beef without detracting from it, a kind of culinary supporting act. Serve this in a deep bowl – the broth is so good that it deserves to be spooned up, both with the meat and potatoes and on its own. That’s one of the reasons for the fairly generous amount of stock I specify. The other is that the next day you have a pasta sauce in the making. Simply remove the meat and potatoes from the broth using a slotted spoon. Pull the meat into smaller pieces and cut the potatoes in half or into quarters (make sure you use good waxy potatoes, or you won’t have anything solid left to cut up). Heat and reduce the broth and then put the meat and potatoes back in for a couple of minutes to heat through. Serve with pasta (fresh rigatoni are perfect) and plenty of grated parmesan, or even better, pecorino. Any stew is better the next day, but this reincarnation as a pasta sauce is so unctuously sublime that it’s perhaps the real reason I make spezzatino in the first place. Brown the meat in oil in large frying pan in a couple of batches and transfer to a heavy-bottomed pan with a lid. In the same pan you used for the meat, lightly fry the onions for five minutes, then deglaze the pan with the wine and cook over a high heat for a minute or two to reduce. Transfer the onions and wine to the meat pan. Add all the other ingredients to the meat pan except the potatoes, bring to the boil and then lower to a simmer. Cook, covered, until the meat starts to become tender. This will vary, but should take about 90 minutes. Add the potatoes and continue to cook over a medium heat until they are ready – about another half an hour. Season to taste. Serve with as much or little of the broth as you like. The meat should be so tender you can practically eat this as a soup, using just a spoon. A light red works well with this, such as something based on frappato grapes, either on their own as a fruity, fragrant monovarietal, or blended with nero d’Avola as part of the fuller Cerasuolo di Vittoria. This entry was posted in Meat, Pasta and tagged meat, pasta by hungryenglishman. Bookmark the permalink. 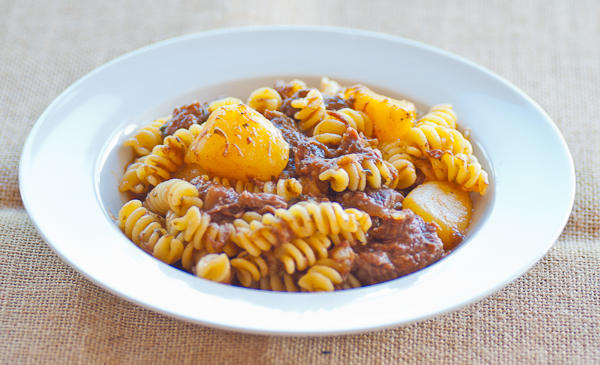 You say rigatoni but then use fusilli…..a better choice! Big Nige.